Over 140 classic cars are for sale at Coys Blenheim Palace sale on 2nd July 2016. In our Blenheim Palace sale preview, carphile.co.uk takes a look ahead at some of the star classic cars going under the hammer. 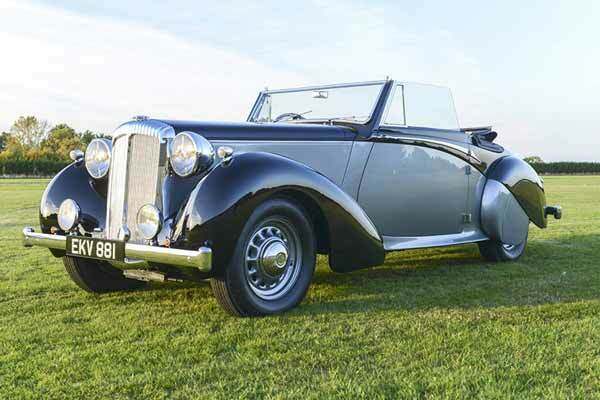 Production of the Daimler DB18 Drophead Coupés started in 1939 but halted when war broke out. The Daimler factory was demolished during the Blitz in 1940 and only eight of the twenty three planned cars were built, five of those eight chassis were destroyed during the attack, leaving only three cars. Chassis 49531 is one of those three cars that Daimler made and the only surviving example today. Daimler loaned the car to Sir Winston Churchill to assist with his political campaigning between 1944 and 1949. The car was fitted with a loud speaker system, with Churchill sitting on the rear deck to address the crowds. More recently the car has gone through an €140,000 restoration (described as extremely comprehensive). The estimate for this car is between £230,000 and £260,000. 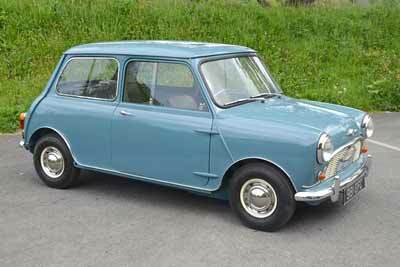 This 1959 Morris Mini Minor for sale is famous as one of the very early press cars, to Autosport’s technical editor, John Bolster, to road test for a year. He raced the car at Goodwood Member’s Meeting in 1960 and several other well-known press car races before buying the car from British Motor Corporation before the test came to an end. He kept the Mini for many years, using it as his daily driver and even to follow the Monte Carlo Rally, before selling it to the present owner, a Mini specialist, tuner and restorer. The car still carries its original number plates, suspension, interior trim, wood-rim steering wheel and the longer corner bumpers front and rear. This Mini also featured in James Rupert’s book ‘Mini: The Complete Story’ as well as in features and adverts in Autosport between 1959 and 1960. Among the classic and historic cars for sale next weekend is a 1973 Rolls Corniche that once belonged to Tiny Rowland and Sydney Dowse. The 1959 “John Bolster” Morris Mini Minor isn’t the only classic Mini for sale, there is also the 1978/79 British Touring Car Championship winning Mini 1275GT Clubman Saloon driven by Richard Longman. Within this years ‘Jaguar Legend’ section, is a 1962 Jaguar E-Type Series 1 3.8 Roadster (estimate £120,000- £140,000), a 1953 XK140 SE Drophead Coupe (£90,000 – £100,000), a rare two-door 1977 XJC (£18,000-£25,000) – amongst others. Ferrari prices are still going strong in 2016 and for Ferrari collectors, Coys have fifteen of Maranello’s finest going under the hammer. Including a 1972 Ferrari Dino 246GT (estimate £250,000- £300,000), a 1982 Ferrari 512 BBi (£230,000 – £260,000) and a 1989 Ferrari Testarossa (£60,000-£70,000). Other important lots include a 1924 Bentley 3/4.5 Litre (£320,000-£370,000), 1962 Bentley S2 Continental Coupe (£240,000 – £295,000), a 2001 Lamborghini Diablo GT (£475,000 – £525,000), a 1919 Sigma 10 HP Tourer (£15,000 – £18,000), a 1967 Aston Martin DB6 (£280,000 – £325,000), a 1935 Derby Bentley 3.5 Litre Owen Sedanca by Gurney Nutting (£175,000 – £195,000), a 1921 Rolls-Royce Silver Ghost London to Edinburgh Style Tourer (£340,000 – £390,000) and a 1990 Lamborghini Countach Anniversary (£370,000 – £390,000).